(excerpt from features): .. MATHEMATICALLY PROVING (not merely suggesting) how ONLY fractality, or PHYLLOTAXIS optimized by Golden Ratio (Phi, 1.618..) creates true HEART COHERENCE. Never before it was actually demonstrated as well as DIRECTLY VISUALIZED, how the same Divine Proportion used in ART and ARCHITECTURE, and by NATURE itself, optimizes the QUALITY (and indirectly, the quantity) OF ATTENTION, and hence of individual experience, health, feeling connected, creativity, etc.. Also is first time directly demonstrated how the FAMOUS FIBONACCI SERIES lies hidden in the HUMAN HEART BEAT. Health professionals who not merely want to replace main stream dogma's by alternative dogma's want to actually understand what they teach their clients, as well as make them understand. This is not always quick and easy. 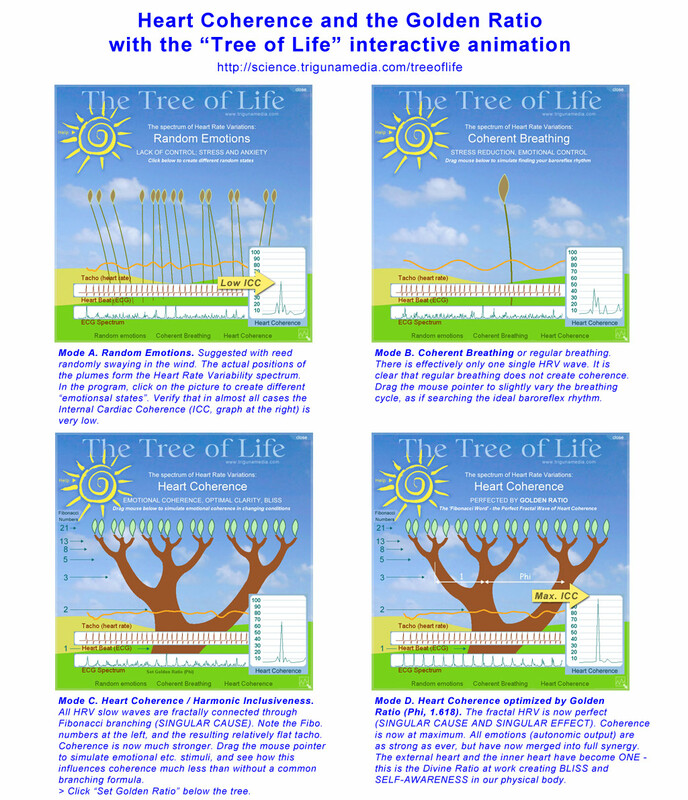 If instead of applying man-made chemicals to the body, you apply man-made electrical frequencies or other magic, you're still in the business of relocating life force, rather than help releasing generic life force and intrinsic healing qualities. Health = Intelligence. In order to structurally restore and increase mental and physical health, the body must be able to remember its original patterns of perfect health. Only this way, our system can directly access the universal resources which created our body and mind in the first place. The way how nature builds, is the way how everything that is built functions. The patterns of construction and patterns of creation are one and the same. Hence, teaching coherence is a deeply systemic approach. It helps to dramatically not only harmonize, but also increase both the quality and the quantity of attention, and hence of life itself. The term "coherence" should definitely apply to the whole process, nor only to its basics. The basic condition to restore health is getting out of stress and anxiety. The term coherence here in fact only refers to "coherent breathing", which in practice means regular breathing. This is an excellent basic excersize to harness (or "freeze") emotions, but you cannot life to the fullest breathing regularly all the time. Mindfulness training or eg. Transcedental Meditation may conceptually be more advanced, but equally do not intrinsically address the need for qualitative progress. They are all essentially quantitative methods, typically for those who do not just fear incoherent emotion, but fear emotion in the first place. It's the semi-spiritual equivalent of adolescent cool. Traditional Yogic etc. systems are typically empathy based, which can be a great refuge out of a world of achievement hysteria, but no ultimate solution either. It doesn't intrinsically help you to get your practical life in order, and in worst cases only feeds on practicality - just replacing cannabis for original hormones. Without emotion there is no scope for bliss. Bliss = optimized empathy, empathy = coherent emotion. Thus, if health means (universal) intelligence, intelligence is not merely a cognitive, quantitative effect, it is qualitative and quantitative. Likewise, without making choises and choosing directions, which are limiting, individuizing factors, there is no scope for self-awareness. Self-awareness = optimized cognition, cognition = coherent focus. The beauty of the (human) heart is that it natuarally unifies empathy and cognition, or qualitative and quantitative awareness. In other words, the heart is nor necessarly more empathic than the brain, but its natural balance feels more empathic to other individuals. Moreover, it is the cognitive function of the heart which allows us, as we all know from literature, to develop the individual focus and commitment to become "Bravehearts". Teaching and training not only stress reduction through emotional control, but evolving both the qualitative and quantitative side of attention through progressive Heart Coherence, is what makes the difference beween mindfulness and soulfulness. on the heart rate, and hence on Internal Cardiac Coherence. In the program, drag your mouse over the screen to play within each setting. 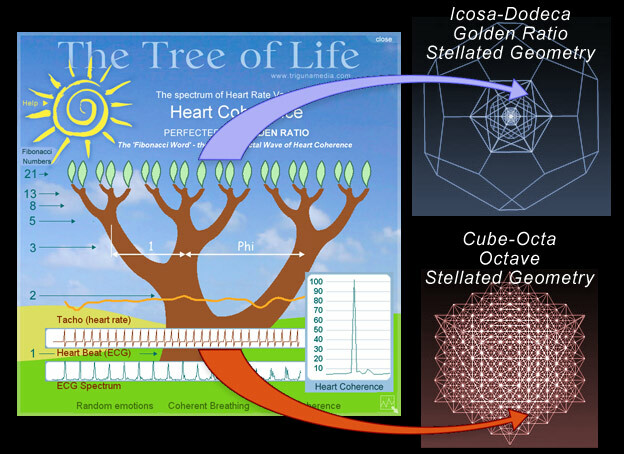 MATHEMATICALLY PROOFING (not merely suggesting) how ONLY fractality, or phyllotaxis optimized by Golden Ratio (Phi, 1.618..) creates Heart Coherence. Never before it was actually demonstrated as well as directly visualized, how the same Divine Proportion used in art and architecture and by nature itself, optimizes the quality (and indirectly, the quantity) of attention, and hence of individual experience, health, feeling connected, creativity, etc.. Also is first time directly demonstrated how the famous Fibonacci Series lies hidden in the the human heart beat. Allthough this is an animation (i.e. not based on real ECG sampling), ALL CALCULATIONS ARE AUTHENTIC - ZERO TINKERING or DATA MASSAGING to make it look good. This way it is demonstrated that a chaotic HRV spectrum leads to low coherence (which is to be expected). More importantly, it is proven directly that regular breathing (including baroreflex training) does NOT increase (and many times, decreases) true Heart Coherence. MOST IMPORTANTLY - it proves that ONLY an HRV spectrum based on Fibonacci / Golden Ratio fractal distribution optimizes Heart Coherence. 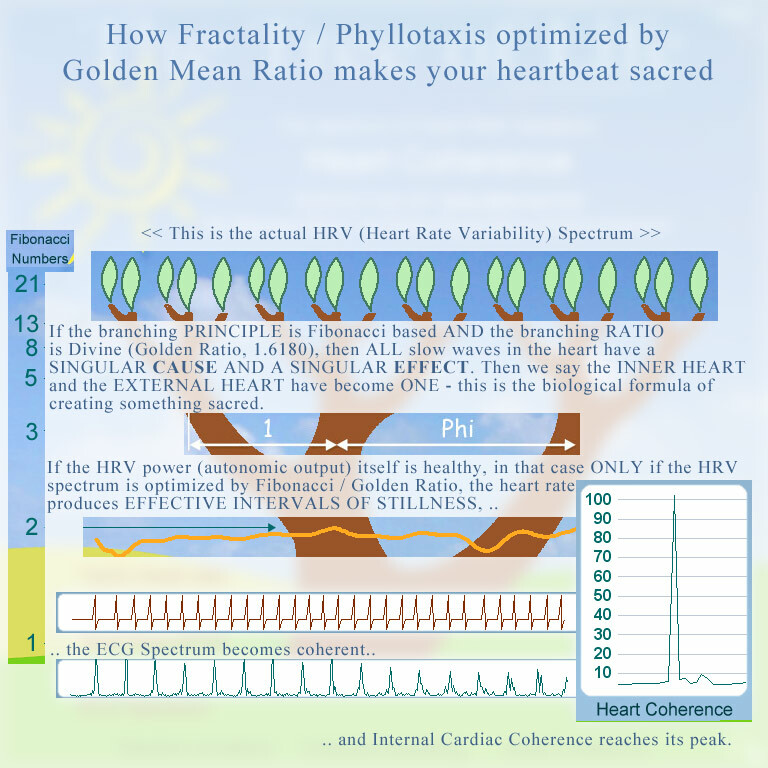 Absolutely fascinating is to see how the "fractal tree" based on a Fibonacci branching algorithm, within limits, STABILIZES Heart Coherence, whereas GOLDEN RATIO distribution of the ALLREADY fractally distributed HRV spectrum, further MAXIMIZES coherence. In real life, this simply means, if the basis is OK, you can withstand a storm or two. THIS VERY DRAMATICALLY PROVES AND DEMONSTRATES THAT AN INTELLIGENT APPROACH TO HEALTH DOES NOT MEAN, FEARING EMOTION, BUT MAXIMUM ALLOWING EMOTION (= GLANDULAR SECRETIONS) TO BECOME COHERENT, INCREASING EMPATHY, SYNERGY AND BLISS. The color of your heart beat: why unlike the brain, the heart ALWAYS produces "primary colors", and all at once. From a purely causal point of view, similar to when you have a spiritual or mystical experience, there is no fundamental difference between creation and perception. They merge, and hence, traditionally speaking, the "observer" as a person disappears. We can take this approach to a somewhat higher and more precise level of understanding, in a scientific sense, once we recognize the existence of an actual wave discipline at the tangential point between matter and abstract. This is the actual point of creation. It is a highly conceptual approach, but rather than something like a "high intellect", it requires a low degree of resistance along with a readiness to postpone judgment, to understand it. In Albert Einsteins words, "the only thing that stands inbetween me and my learning, is my education". Now assuming this is the setting, we may discover some interesting parallels, as well as differences between the principle of perception (in this example, vision), and the inner principle of the heart. In short, this means that whereas the eye creates a differentiated, perceptual reality, the heart creates a non-differentiated, existential reality. Again, as this is a causal approach, the principal sense organ here is projective, not receptive. In a somewhat technical sense, we can say that the imminent wave discipline or coherence of the original medium, which we refer to as abstract, manifests biologically as either an individualized (quantitative) or an empathic, synergetic (qualitative) aspect in evolution. Both aspects or paths of synthesis are equally important. However in the course of evolution the paths of synthesis develop from being opposed, to being balanced, to being fully complementary. Psychologically, this equals an evolution from objective toward subjective orientation. For example in the case of an insect, we can hardly speak of any level of individuality. It is as if matter has self-organized to form this small creature, but nothing more than that. It is guided by the macrocosm, it barely has a mind of its own. Opposite to that, imagine a Yogi in a transcedental state of mind. He has touched the highest state of subjectivity ("Parama Paresha" in Sanskrit). In the case of a Yogi, detaching himself from the material world, from his physical body, and even the objective portions of his mind, this is not specifically the result of his experience, but the actual cause of it. That is, this is his Yogic discipline, to dramatically accelerate his path of subjective synthesis. On an existential level, the difference between the mutual synthesis paths (paths out of chaos) are somewhat theoretical. That is, they may be distinguishable, but they cannot in an absolute sense be functionally separated. This is the case with the inner and external heart. If however the biological expression is such that there is a functional difference between the two synthesis paths, this creates a specific energy and information exchange between the two paths. This cross-mediation between the two physiological paths out of chaos is the essence of perception, and consequently of reality creation. Reality creation obviously does not only involve what we normally consider the external world, but also the biological body itself. Once again, this is a causal and not an empirical approach. In the case of perception in general, there is energy and information exchange. This cross-mediation between the two paths out of chaos is not at all random. In fact it is highly organized, in a way which subtly reflects the imminent wave coherence or creative potential of the abstract that causes it. In a somewhat popular sense this became known as Sacred Geometry. However Sacred Geometry has somewhat developed into the direction of a belief system, along with some typical esthetic and pseudo-scientfic elaboration, concealing rather than revealing its intrinsic sacredness. Note that a photon, allthough it is a particle, also has a wavelength, because it combines resp. a qualitative and a quantitative aspect of creation. The newly discovered Higgs boson does the same, but oppositely. Hence it is referred to as a scalar boson, wheras the photon is a vector boson. Therefore, we may argue that mass (the essence of physicality) exists as a principle, or only in connection with particles, however in the case of particles we must acknowledge that the Higgs alone cannot be responsible. There must also be a purely quantitative factor. This is the photon, and therefore the photon itself must by definition be massless, which is the case. It is immediately clear that the angular freedom in the case of perception, is the very cause of creation. This relative freedom does not exists in the heart, as in the heart, unlike in the perceptual brain, the individual and empathic paths of synthesis, out of chaos, cannot be separated. But right because of that, the heart always remains precisely what it is: the Heart. Therefore, the heart, even when it looses itself in the turbulence of life, it may weaken, it may be tainted, but never ever it will alienate from itself. This is its strength and the reason why the heart has been and is a symbol of hope and eternity in all cultures that ever existed, and equally in mysticism and verily in life itself. It is in fact so iconic and enigmatic that we take it for granted, but in truth, it is the one single most eternal symbol that we also can touch and feel. Light comes in many colors, and if light turns white, individual colors synergize (not just mix) and dissolve. Similarly, if we feel our soul, our individual personality dissolves. This is the light of the heart. However it does not come in many colors, it is always white. This is the essence of mystical experience, of which we might say it is the inner experience of physiologal coherence of the highest order. Just like the particle of light is a photon, we might argue that the particle of the heart is a "Cardion" - another term for what we know as soul. Like the eye, the heart is also a sensory organ. However unlike the eye, it does not sense a material reality - it senses it Self. of perceptions given to our soul, then what is the source of these perceptions"? In botany, phyllotaxis or phyllotaxy is the arrangement of leaves on a plant stem (from Ancient Greek phýllon "leaf" and táxis "arrangement"). Phyllotactic spirals form a distinctive class of patterns in nature. Physical models of phyllotaxis date back to Airy's experiment of packing hard spheres. Douady et al. also have shown experimentally and theoretically that phyllotactic patterns emerge as self-organizing processes in dynamic systems. In 1991, Levitov proposed that lowest energy configurations of repulsive particles in cylindrical geometries reproduce the spirals of botanical phyllotaxis. More recently, Nisoli et al. (2009) have shown experimentally and numerically that indeed that was the case, by constructing a "magnetic cactus" made of magnetic dipoles mounted on bearings stacked along a "stem". They also revealed that these interacting particles can access novel dynamical phenomena beyond what botany yields: a family of highly non local novel topological solitons emerge in the nonlinear regime of these systems, as well as purely classical rotons and maxons in the spectrum of linear excitations. They named these novel phenomena "Dynamical Phyllotaxis", as they appear in physical systems whose statics is dictated by the number theoretical laws of phyllotaxis. Close packing of spheres also generates a dodecahedral tesselation with pentaprismic faces. Pentaprismic symmetry is intimately related to the Fibonacci series and the golden section of classical geometry. This relationship has been explored at length by Matila Ghyka. The term Phyllotaxis refers to the patterns on plants formed by the arrangement of repeated biological units. In nearly all cases, the Fibonacci Numbers and the Golden Ratio occur in these arrangements. Over a period of more than two decades, Irving Adler wrote papers that construct a rigorously derived mathematical model for Phyllotaxis, which are major and enduring contributions to the field.